The Madman's Daughter | What YA Reading? The most appealing aspect of The Madman’s Daughter stems from its origin. A new and hot take on H.G. Wells’s The Island of Doctor Moreau, this novel features a callous mad scientist’s estranged daughter. Conveniently, it also twists two of the classic’s original characters, Edward and Montgomery, into attractive teenage boys. 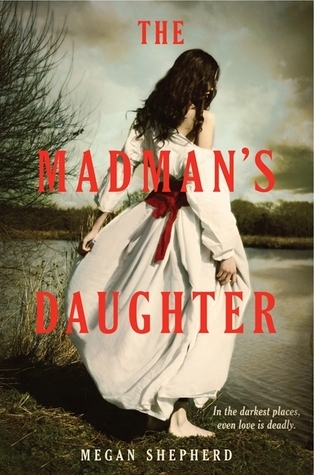 The Madman’s Daughter, sold as a Gothic thriller, immediately piqued my interest. From its first page– opening in a dreary London whose dank basements have absorbed untold terrors– to its last page– sketching an uncharted island containing one too many unnamed beasts– I have to say that this novel’s setting is extremely well done. My kudos go to Shepherd for verbally illustrating a world that’s not quite scary, per se, but sinister somehow. These nightmares slowly creep up on you, ominous but not entirely present until it’s too late to run from them. Oh sweet disquietude, why must I delight in your torture so? Had Shepherd chosen to stick to what she does best, her readers would have been infinitely more pleased. Unfortunately, she chooses instead to explore the realm of teenage hormones and lays the romance on hot and heavy. Because that’s all too realistic; had I traveled months to visit a father who abandoned me a decade ago, braved atrocious monsters that should never have seen the light of day, and had to discover an island’s darkest secrets piece by piece, hawt boys would be all I could think about. I don’t even know how I could remain focused on the task at hand, I would be so consumed by my wanton daydreams! Shepherd captures the essence of the adolescent female perfectly. We’re nothing if not frivolous and boy-crazy. Moreover, it’s not like Juliet’s love interests are dazzlingly irresistible or even mildly attractive. You’ve got Montgomery, the seemingly innocent boy next door who was sort of sweet when he was kid (and therefore inexorably tantalizing to our protagonist) and Edward, who has nothing going for him other than his savage good looks and air of mystery. Juliet met Edward when he, shipwrecked, was picked up by her boat, you see. But that’s teenage girls for you; we just fall hard for everybody who passes our ships on a dinghy. Regrettably, The Madman’s Daughter‘s intense focus on romance engendered a series of hiatuses in its plot. I’m all for physical displays of attraction, but this “Gothic thriller” ‘s promiscuity affected me in more ways than one. Lulls in the plot just aren’t my thing– especially if they’re caused by pretty girls kissing pretty boys (and doing nothing else). Nonetheless, Shepherd did redeem herself towards The Madman’s Daughter‘s ending. The last dozen chapters were so unputdownable that I did not see the twists coming in the least. Yes, twists, as in plural, as in two, as in my mind was so excessively blown as to result in many hours of sleep lost (both due to my compulsive reading and my compulsive shouting of “no freaking way!”). The grand finale’s suspense was ramped up to dangerously high, the sluggish plot finally picked up the pace, and small horror after small horror assaulted my willing mind. Furthermore, the execrable love triangle was resolved in a way so utterly satisfying that I did not think it possible. Perhaps Shepherd knows how to write a romance after all. Don’t let me scare you away from The Madman’s Daughter. Truly, I enjoyed it thoroughly (although I’m not sure if reading it or mocking it was the most fun). I could go so far as to call it a beach read– if you’re the type of person who vacations at abandoned lighthouses, reading ghost stories into the dead of night. 3.99/5 stars. 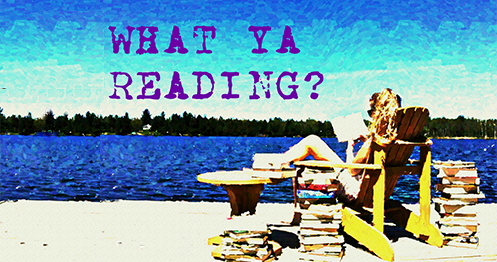 Pingback: A Great and Terrible Beauty | What YA Reading?